Bike riding is not just a hobby for many but a burning passion that they so carefully nurture. While not all go out and become professionals, most of them keep their passion alive by pursuing their passion in their own way. Bikes, bike riding and long trips bring to mind a nice open road, but there is more to biking than just the road. There have been a number of magazines which are dedicated to bikers and bikes one among them is the Rider. The Rider magazine is quite popular in the United States of America. This magazine is specially designed and made for those heavy bike riders. Be it a Suzuki charmer or the heavy Harley Davidson the Rider has views and reviews on all. 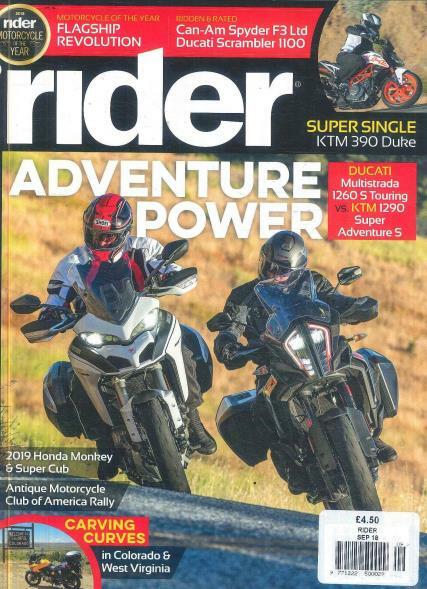 The magazine also has in-depth reviews about the various products and their tests, professional bikers and their views, tips on maintenance and everything that one would want to know about bikes. The magazine also features candid interviews with pro bikers and their biking experience makes the magazine a hot favorite among bikers. All those biking enthusiasts can now read about the bikes and their favorite bikers by subscribing for this magazine. An annual subscription will reap double benefits as one will save money on this subscription and also receive the magazine edition after edition right at their doorsteps.